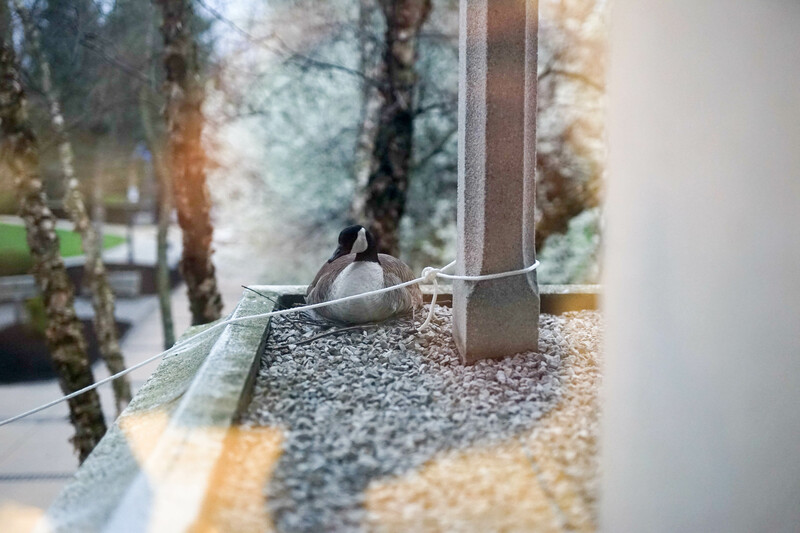 A mother goose has made her nest on the second floor ledge of Irwin Library. Photo by Adam Cvik. Be-Honk-cé. Goosey McGooseface. Professor Plume. These are some of the names Butler students came up with when asked by the Butler Libraries Twitter page to name the goose that has been perched on Irwin Library’s second floor ledge in a nest of five eggs. For the past few weeks, several geese have made Butler University their home. They can be found on the mall, on the fields, and yes, the second floor of Irwin. Sophomore Spanish major Nikki Keller even had an incident with two geese while walking to Jordan Hall. She said one started raising its wings and flapped them, honking at her. The other flew over Keller’s head. If she had to name the geese that chased her, she would name the one that flew over her head ‘Albert’ and the aggressive flapper ‘Lucifer,’ like the cat from Cinderella. “He’s all jumpy and showy, but he doesn’t do anything,” Keller said. Keller is fine with the geese for now, as long as there are a few of them. She is worried there will be a recurrence of what happened when she was in middle school, where a few geese turned into a whole flock. Junior psychology and anthropology major Emily Stark said she is not bothered by the geese. Stark opted for the name of Geese Witherspoon, same as what the Butler Libraries voted for. Butler director of facilities Gerald Carlson addressed the problem of the geese. Carlson said after the eggs hatch, the small family will need to be removed from the ledge of Irwin. In a few weeks, the semester will be over, but until then, beware of the geese. Keller warns students not to feed the geese. And if a fluffy, gray feather floats into your venti iced coffee, blame Be-Honk-cé.